As in other regions of Italy, the Veneto area produces many regional specialty foods and wines. Near the Rialto market you can find shops selling meats, regional cheeses, spices, locally grown vegetables and more. However, scattered among the small streets of Venice there are also some amazing gourmet specialty food stores offering house-made chocolates, regional wines, handmade fresh pasta and truly gourmet gelato. These are specialty food stores worth seeking out for the sheer pleasure of tasting artfully prepared foods in Venice. An absolute must for gourmands, long-term visitors and all hungry people in Venice. 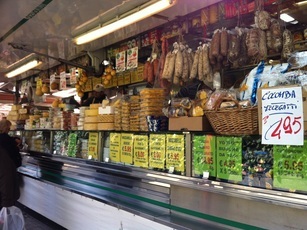 The weekly market on Lido has a reputation for it's fabulous views of the Laguna di San Marco, but what they don't tell you is that it is also jam-packed with Italian specialty foods from all over Italy. And, most of it is available at prices at least 20% less than the same foods - if you could find them at all - would cost in central Venice. Rialto is still the place to go for fish, but if there is anything else you want, from plastic house shoes to the mythical Sicilian pistacchio butter, you will can find it here. Get There: The Weekly Market on Lido is open only on Tuesdays from 7AM - 2PM. It is easy to reach from Venice. Take any Vaporetto to Lido, turn right and continue strait on for ten minutes or so. Just as you begin to wonder if you're going the right way, you'll begin to see people with shopping bags and carts streaming towards you. Keep going and you'll be there! To discover more of the daily and weekly markets in Venice: Try the interactive market map published online by the Citta di Venezia. Unlike any other bacaro, bar or restaurant in Venice, Fiumefreddo Bio (Cold River Organic), is a small bar/ restaurant that offers only carefully selected and lovingly prepared organic foods and wines. The place is small and cozy; just a few tables indoors and out. And the selection of foods, all organic and mostly vegetarian, is always flavorful and varies, naturally, based on the ingredients of the season. Here, you will find the owners hard at work in the tiny open kitchen and their adorable dog trotting around offering paw-shakes and hugs to everyone who happens through the square. Warning: You may have trouble tearing yourself away from this welcoming spot! Al Canton del Vin, Salizada San Francesco # 3156 Castello, Near San Franscesco Della Vigna. 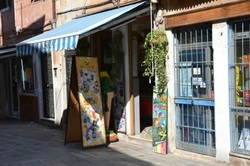 A neighborhood wineshop in Castello for which the neighbor's save their empty water bottles. Al Canton del Vin has a wide selection of both bottled and "sfusi" wines. Sfusi wines are simply wines in the barrel that have not been bottled yet. If you bring your own bottle to this shop, you can snag great deals on some excellent regional wines! Beatrice Tea Room at Ca'Fujiyama B & B, Dorsoduro on Calle Longa San Barnaba Near Campo San Barnaba. A tranquil oasis in Dorsoduro, Tea Room Beatrice is close to everything in Dorsoduro district - the Accademia, the Zatere, Campo Santa Margherita - yet a world away from the bustle of all of those places. Here you can chose from more than 50 varieties of teas, and pair them with delicious pastries from Vizio Virtu. Enjoy them in the garden for a completely relaxing and refreshing break from life in Venezia. on Calle Fava, Near Campo San Lio. Forget the Belgians, come see what Venetians can do with chocolate! Vizo Virtu is an artisanal chocolate shop in the Dorsoduro district of Venice. All of their incredible array of sumptuous chocolate treats are made on the premises. There is enough variety to suit every taste. I am especially enamored of the large pieces of candied fruits dipped in dark chocolate and the bars of chocolate sprinkled with crushed chiles. Learn more, or just become more tempted, on their website. Gelateria Alaska, 1159 Santa Croce, On Lista dei Bari. If Venice has the best gelato in Italy, and Gelateria Alaska has the best geleto in Venice, does that make the gelato at Alaska the best in the world? Carlo Pistacchi, the owner of this unassuming ice cream stand certainly makes gourmet gelato and sorbets out of just about any seasonal fruit, vegetable, herb or spice. The favors range from traditional through the highly unusual such as ginger, fennel, and cardamom gelato and sorbets made from fresh salad greens. If you really want to get the most out of your Venetian culinary experiences, do not miss Gelateria Alaska. Pastaficio Serenissima, 3455 Castello, On Salizzada dei Greci. Though many shops around Venice sell bags of dried exotic looking pastas, Pastaficio Serenissima is one of few remaining shops in Venice that sell fresh pastas. The pasta in here shop is handmade daily on the premises using ingredients fresh from the Rialto market. Arrive at the right time of day, and may even get a lesson in making pasta yourself! The tortellini and ravioli stuffed with seasonal vegetables are amazing. Meanwhile, the friendly staff will help you determine exactly much you need for your meal and will give helpful tips about cooking times and what other foods to pair with your pasta. Gelateria Il Pinguino, Castello, on Riva Schiavoni Near the Naval History Museum. Take the lovely walk along the Riva Schiavoni from Sant Elena to Piazza San Marco is an essential itinerary for Venezia. Half-way through, stop for a gelato from Il Pinguino. The fresh gelato is made in-house, and though they always have the classics - vanilla, melon, yogurt, chocolate - you can sometimes find some truly unusual flavors like rosemary & basil. From there, you can either sit on the benches beside the Canale di San Marco or continue ambling along into the sunset. Agricola Borga Vini e Spumante, 1614 Dorsoduro on Calle del Avogaria. Agricola Borga is a Veneto-based vineyard that recently opened this, atmospheric shop in Dorsoduro. Here you'll find strictly locally-produced, great wines at reasonable prices. You can purchase young sfuso wines, bottles of aged wines to bring home, or even box wines for cooking or picnics. Don't be shy with your questions when shopping here! They're glad to tell you anything you'd like to know about the grapes, strength, age and flavors of wine. And, we've heard that it's even possible to arrange to visit the vineyard in person. MEA Libera Tutti is Venice' first and only dedicated gluten-free market. Opened by Azzura and Enrico, who were originally inspired by parent's desire to provide the best nutrition for their child who suffers from celiac disease, MEA has become a resource for everyone who strives to eat healthy and gluten-free in Venice. 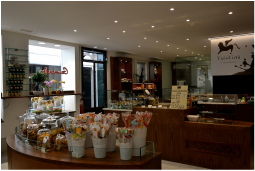 The shop offers a wide range of organic and gluten free products from prepared rolls to flours to pastas and candies. Meanwhile, they also provide catering for parties and celebrations as well as gluten-free breakfast and lunch options for gluten-free guests of Venice' hotels. Those renting apartments in Venice, can contact MEA in advance to order gluten-free supplies for their stays. Pastificio Giacomo Rizzo, 5778 Cannaregio, Near Campo San Bortolomeo. 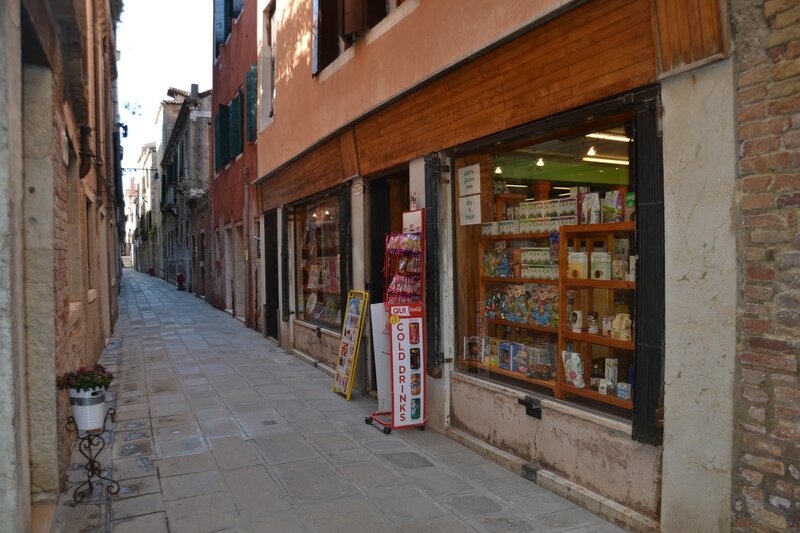 The historic Pastificio Giacomo Rizzo is an essential specialty food shop for everyone in Venice. Not only is it one of the last remaining shops in Venice that make and sell their own genuinely fresh pasta. They also have an excellent selection of Italian specialty foods and spices that both compliment any dinner you're making in Venice and are suitably packaged to bring home. 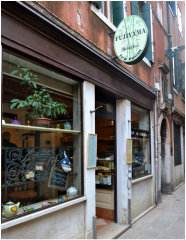 But, beyond all of that, Giacomo Rizzo also has the best selection of international specialty foods of any shop in the center of Venice. Do you want peanut butter, rice, curry, coconut milk, tandoori sauce, baked beans, or, Maple Syrup in Venice? Look no further. Giacomo Rizzo is very centrally located, and deceptively small in size, but if there's any shop in Venice that has that one special ingredient that you just can't seem to find anywhere, this is probably it.